This beautiful passage was written by Emile Zola in his La Ventre de Paris (The Belly of Paris). An immensely descriptive, humorous and exciting novel, it is the third of his twenty-volume series of Les Rougon-Maquart novels; still little known in this country. La Ventre de Paris captures the essence of Le Forum des Halles: the central gathering place and traditional market integral to the lives of Parisians for 800 years. In 1971 the food stalls of Les Halles were removed. Intricate glass and metal sculptures were built-in their place, which though controversial, create the strong impression that you are standing in a former open-air market -and it is today every bit as colorful and chaotic as it was in Zola’s day. I love this bustling nucleus of Paris: its noise and confusion; the filthy, arrogant pigeons that march around us as if they own the place (which of course they do in their little bird brains). I am fond of the restaurants where I spent innumerable hours in (in another life and many years ago) like La Poule au Pot and Au Pied de Cochon, which is open 24 hours. Here, at the tip of Rue Montorgueil, in the midst of the bailemme that is Les Halles sits Saint Eustache church, a masterpiece of late Gothic architecture. Designed by Italian architect Domenico da Cortona, the construction was lengthy (1532-1637). During that period the gothic style fell out of fashion in favor of renaissance, which explains why a gothic church features unexpected renaissance details. It has a ground-plan analogous to that of Notre Dame with a nave of five bays and a choir aisle with 24 chapels. The high cupola reaches a height of 190 feet. So, I was in Paris -breathing in the city rather than exploring her, and casually I strolled inside Saint Eustache. It was the first time in almost 20 years that I ventured within its sacred walls. No, I did not take a trip down memory lane. I just admired my surrounding silently. Saint Eustache has not changed much. The beautiful stained glass windows, which were created by Antoine Soulignac, and likely modeled after drawings by Philippe de Champaigne were still there. Intact and with the perfect radiance of a minor masterpiece. The pipe organ, containing 8,000 pipes, is the largest in France. It was silent during my visit, but it is a sleeping giant capable of producing some of the world’s perfect music. And of course I admired the paintings by Santi di Tito, fellow renaissance brethren to Piero della Francesca (and fellow citizen) and Rubens. The church was mainly empty. A couple of tourists were looking around with tired faces and uninspired expressions. The silence was covering the gorgeous interior like a warm blanket. A beautiful woman with striking red hair was admiring the expansive interior, walking slowly, her figure occasionally obscured by the shadow created by the game of light. I sat in a chair, thinking of the young Louis XIV taking his first Communion here. In my mind I saw the Cardinal Richelieu and Jeanne-Antoinette Poisson (the future madame de Pompadour) being baptized, and I saw the distressed face of Mozart at the funeral of his mother. I also saw the happy expression of Moliere getting married to Armande Claire Bejarde. I thought of all of them, all of the events that have happened here at Saint Eustache. One thing has become clear since my last visit. Saint Eustache requires a great deal of love and attention. Centuries of smoke from the candles have left a dirty gray coat on the walls; the marble pillars are chipped in many places; chairs are scattered around like fallen leaves. Many of the 24 chapels are as unkempt as the hair of a rock star. 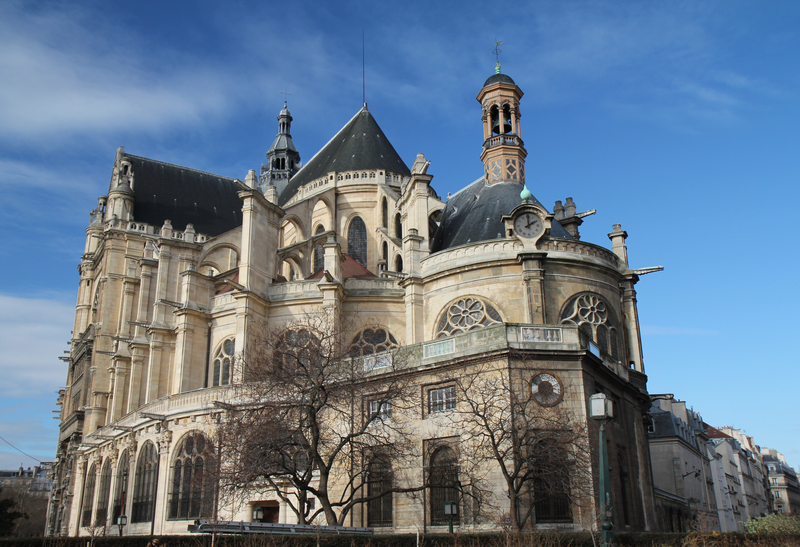 Saint Eustache parish hosts numerous activities, and touches the lives of many in the phantasmagorical surrounding that is Les Halles. Music, both sacred and contemporary can be heard here regularly, and the rotations of expositions and events make Saint Eustache as busy as an American airport on Thanksgiving. Social justice and community outreach also play a fundamental role in the life of the parish; and the Center Cerise, a cultural hub for artists and arts group (some well-known) is housed here. Sancerre is a great white wine. Produced in the easter region of the Loire Valley, it is a semi-dry variety that comes from Sauvignon-Blanc grapes. In my opinion it is also a perfect aperitif. It is what I was drinking in the evening after my visit to Saint Eustache, sitting at a cafe’ across from the church and the Rue Montorgueil. As I was sipping that flawless, cold Sancerre, I thought about the universal value of art and architecture. Of how sacred places of worship are fundamental pieces of the community everywhere, and beautiful architecture is the mirror of an intense community life. Just like those pigeons that were lazily moving about outside Saint Eustache.